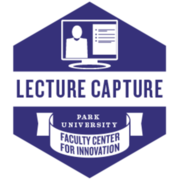 Lecture Capture refers to the process of recording and archiving the content of a lecture, conference or seminar for the purpose of sharing with a larger audience, in an online course, or through other educational venues. This badge acknowledges professional training and strategies to create and utilize lecture capture to improve the learning process. Recipient participated synchronously or asynchronously in a Faculty Center for Innovation-sponsored learning community on the topic of Lecture Capture and has produced a reflection on how the knowledge gained has affected his/her teaching, scholarship, or service.